China's Silk Road Economic Belt is the largest and most ambitious undertaking yet proposed by Beijing. With financing and the value of resources across Eurasia running into hundreds of billions of dollars, we outline the fundamentals of China’s plans. Included are details of the overland route from China through Central Asia, Russia and to Europe, and the maritime and overland routes through South-East Asia and beyond. Includes maps. As envisioned by Beijing, the new Silk Road Economic Belt and Maritime routes will comprise two distinct transportation corridors: a land route that connects Xi’an in West China to Duisburg in Germany and Rotterdam in the Netherlands by way of Central Asia, and a sea route that connects South China to North and East Africa by way of Vietnam, Malaysia, Indonesia , Sri Lanka, Myanmar and India. China is prepared to invest hundreds of billions of dollars in making this happen over the course of the next few decades. It is the largest diplomatic and infrastructure effort ever put into place. In the words of President Xi Jinping, it will create the world’s biggest single market. It is already known that China spends 8.5 percent of its total GDP on infrastructure, the highest percentage in the world. Getting to grips with accessing that in the form of infrastructure projects is an issue right at the top of every major manufacturer and contractor involved in infrastructure development worldwide. 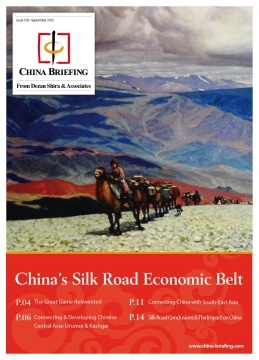 This issue of China Briefing outlines the fundamentals of China’s proposed new Silk Road Economic Belt. It begins by highlighting the overland route that encompasses Central Asia, and then details plans behind maritime and overland routes through South-East Asia.